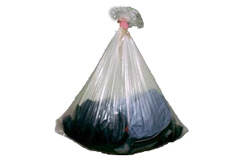 Hot Water Soluble Laundry Bags are water soluble and biodegradable, making transporting your infested clothing and linens a safe and simple process. Hot water soluble laundry bags feature a environmentally safe dissolvable material. Great for travel or clean up during a bed bug infestation these laundry bags make transporting and washing your infested clothing and linens a simple and safe process. By using hot water soluble laundry bags during treatment you will minimize the spread of bed bug infestation. * Not for use with laundry detergents containing Boric Acid or the laundry additive "Borax". The use of "Borax" or detergents containing Boric Acid will interfere with the dissolving of the product. If you have inadvertently used these products and find that the product has not properly dissolved, you will only need to wash the load of laundry a second time to eliminate the remainder of the residue. Wash in HOT water.